Last night, I went to see Josh Blue at the Boulder Theater. It was a benefit to celebrate the 30th anniversary of the Center for People With Disabilities in Boulder. My company is a sponsor of the CPWD, so that’s why I got to had to go. Remembering my previous experience with the Boulder Theater, and noticing that seats for sponsors were going to be especially good ones (ie, especially inaccessible ones), I called the Center. I asked if the Boulder Theater had somehow magically changed since I’d been there, or if the Center Had A Plan. No, the theater hadn’t changed. 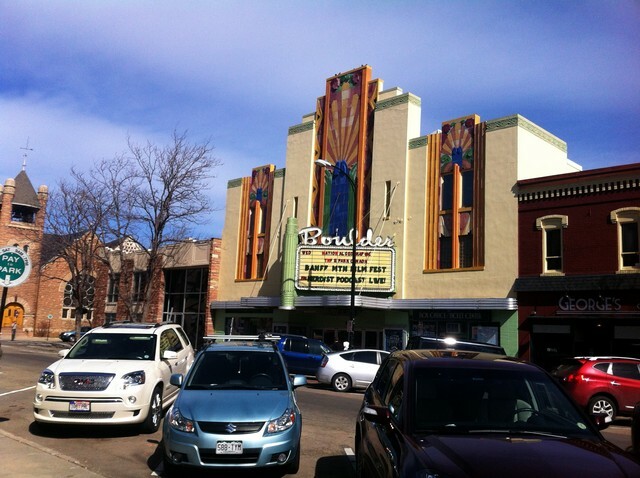 The director of the Center acknowledged that the Boulder Theater wasn’t very accessible, but pointed out that after all, it was an Historic Building (like the Boulder Bookstore, a few blocks away). I pushed through the slightly surreal experience of having an ILC director give me that crap excuse, and asked what the Plan was. The Plan was for wheelchair users to gather at the entrance, go around the block, through the alley between the back of the theater and the parking garage, up a piece of plywood strategically placed to ramp a step, up and down a backstage corridor, and into the theater at seating area B. There would be people to help make sure the plywood didn’t slip under the weight of the powerchairs, and to help manual chair users who might not have the strength to get up and down the slopes. Excellent. Just so long as there’s a Plan. Monday morning I picked up the tickets from my administrative assistant. There were four tickets for the four of us: A 18 Center, A 19 Center, A 20 Center, and B 7 Left (the latter nicely marked “Wheelchair Access”). I asked my admin to see if I couldn’t get a seat together with my husband. She reported back that the Center and the theater were going to be very flexible about seating, and not to worry about which seats we had been assigned. Tuesday evening. Lines of wheelchair users, family and friends trouping through the alley. After every powerchair, someone had to set the plywood up again. I took a good long run at, made it up just before the plywood fell down. Theater employees were rearranging chairs for all the chair users and their friends. Then the general public came in. In my seat on the aisle, I got to hear theater employees telling dozens of paying ticket holders that they couldn’t sit in the seats they’d paid for because “we have all these wheelchairs”. They managed to convey that it was completely out of the theater’s control. The patrons, in turn, were justifiably annoyed with “these wheelchairs”. No one kept track of how many people were holding Section A tickets but sitting in Section B. I tried to give my Section A ticket to a woman who was being turned away, and the theater goon wouldn’t let her have it. Josh Blue was funny enough, I guess. I wonder if Mr. Blue knew whether he would perform in such venues. What were they thinking?? I know, I know. They *weren’t* thinking. Gah. And I just learned that the theater management didn’t want sign language interpreters on the stage with Mr. Blue. The Center director talked them into it. I’m going to say that 90% of the problem is attitudinal. i add to the incredulity that someone like him would perform in a venue so ill equipped to deal with chairs and disabled patrons. i hope he was informed afterwards, at least, of the poor planing. I strongly suspect that Josh Blue, as an ambulatory performer, can’t afford to be that picky – as Midlife and Treachery points out, it’s not like comedy clubs are renowned for their accessibility. Josh Blue – NBCÃ¢â‚¬â„¢s Ã¢â‚¬Å“Last Comic StandingÃ¢â‚¬Â is a gifted stand-up comedian and talented U.S. Paralympic soccer player, Josh Blue refuses to bow to any of the challenges that come from living with cerebral palsy. He jokes, “I realize that people are going to stare so I want to give them something to stare at.” He uses his self-deprecating sense of humor to defy stereotypes and encourage others to overcome their pre-conceived notions about disabled people. Theatre is not completely wheelchair accessible. There are four entrances. Two have more than twenty steps. How tragically predictable. Our Historic Buildings represent themselves so well, don’t they? Wow. and to think that it happened at a benefit to celebrate the 30th anniversary of the Center for People With Disabilities. How ironic.